A Legal Fight between the residents of Jayanagar 3rd Block with the Government and other bodies to save a Lake. The residents of RBI Colony, Jayanagar 3rd Block East, Bangalore-560011 relentlessly waged legal battle in civil court, High court and Supreme court for 19 Years under the leadership of Sri Venkata Subba Rao and saved Byrasandra Lake. Byrasandra Lake (Survey No.56) - now a lake bed with an area of 14.11 acres is situated at a distance of 1KM from Jayanagar Shopping Complex. It is adjoining RBI Colony and NIMHANS staff quarters. In the year 1985 Govt. of Karnataka constituted an expert committee under the chairmanship of Sri N Lakshman Rao, IAS (Retired) to examine all the view to maintain a desirable environment. The committee made detailed study and submitted the report with the recommendations in 1988. The Government accepted the recommendations and issued a notification to that effect on 11th Feb, 1988. 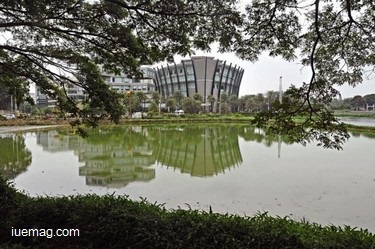 The expert committee recommended that lakes in and around Bangalore should be developed as indicated in the annexation to the notification by the Horticulture department. With respect to Byrasandra lake the committee decided to maintain water sheet partly and recommended that forest department may examine the feasibility of developing the foreshore as a tree park. In the year 1992, Corporation of the city of Bengaluru (erstwhile BBMP) started filling up the lake with debris in view of the shift of slums from NIMHANS staff quarters compound. The residents filed a PIL (Public Interest Litigation) in the High court of Karnataka and bought an interim stay. The court ordered that filling up the lake should be stopped forthwith and further ordered that no human habitation on the surface of the lake bed should be permitted. The writ petition came up for the final hearing in the year 1998. The interim stay given in 1992 was made absolute. In the year 1999, residents came to know about the pendency of 3 writ petitions filed by some people in the year 1996 claiming that they are in peaceful possession of the survey no.56 (Byrasandra Lake) and it’s not to be dispossessed. The residents filed an impleading application and on admission filed objections stating that documents provided before the court are false praying for a police investigation. On service of objections the petitioners filed a memo withdrawing the petitions and accordingly the petitions were disposed as withdrawn. In the year 2000, Bengaluru Mahanagara Palike (BMP) started fencing a portion of the lake. While the fencing was in progress the residents who filed writ petitions in 1996 filed an original suit against BMP and brought an interim stay, and thereby, the fencing of the lake was suspended. The interim stay had been obtained without serving notice to BBMP as required under the law. The residents filed the writ petition stating that the interim stay had been obtained against the BMP and that the claims of the plaintiffs in the civil suit are imaginary, false and void and that the plaintiffs should be directed not to enter the Byrasandara Lake. The high court directed the trial court to decide the maintainability of the suit within 4 weeks from the date of communication of High Court order and permitted BMP to complete the fencing subject to the final orders passed in the civil suit. The civil suit was disposed by the court within 4 weeks from the communication of High Court order. The suit was dismissed and the court levied a penalty of Rs.5000/- on each of the plaintiffs. The order passed by the High Court directing the civil court to dispose the suit within 4 weeks from the date of communication of High court order was challenged by the plaintiffs in the civil suit by filing a Special Leave appeal before SUPREME COURT. The Supreme Court dismissed the special leave appeal with an observation "That the court will decide the dispute without reference to order under challenge". Taking the advantage of Supreme Court observations the plaintiffs, although the original Civil suit had been disposed, filed a miscellaneous suit praying for the temporary injunction restraining BMP from taking possession of the lake for the completing of fencing and the suit was dismissed. In 2004, BMP spent Rs.120 Lakhs for the development of the lake. However, no development was visible. In 2005, debt recovery Tribunal notified for public Auction of Byrasandra Lake!! The lake had been offered as a collateral security to a public sector bank for the credit facilities availed by a builder and developer. The residents filed a PIL in the High court for grant of stay of the proceedings before the DRT (Debts Recovery Tribunal). The High court did not grant stay but ordered issue notices to the respondents, The lake was sold for Rs.760 Lakh in the public auction!! The residents approached the high court again for staying further proceedings in the DRT. The High Court ordered stay of the further proceedings in the DRT. The writ petition came up for the final hearing in 2011, the High Court set aside the auction conducted by DRT and declared that the survey No.56 constitutes a lake bed and vests in the state and shall be maintained by BBMP. The public sector banks filed an SLP (Special Leave Petition) in Supreme Court and they were dismissed. Guddali Puja for the rejuvenation of the lake was performed on 21-11-2013. The work is in progress. Sri S Venkata Subba Rao, Sarvasri G S Vishweswara, Senior Advocate, Ari A Madhusudan Rao and Sri G V Chandrashekhara advocates waged the legal battle in courts. Sri Venkata Subba Rao was Awarded with prestigious “Namma Bengaluru Award" for the year 2014 for his excellent hard work to save a lake for the public utility. Source: A letter handed by Sri Venkata Subba Rao during Namma Bengaluru Awards Ceremony.